Which Amino Acids Are Right For You? As a former athlete and current weekend warrior athlete you are probably aware that you should be taking a protein supplement and a multivitamin to help with your training. What else do you take though? If you walk into a GNC store or browse on-line there are countless options to take including amino acids. Amino acids are great to take for a variety of reasons. 1. Amino Acids are the building blocks of protein. 2. Amino Acids are required for protein synthesis. 4. Amino acids help to fuel muscle cells. These are all great benefits for a serious athlete or someone just trying to stay in shape and maintain a healthy physique and body. 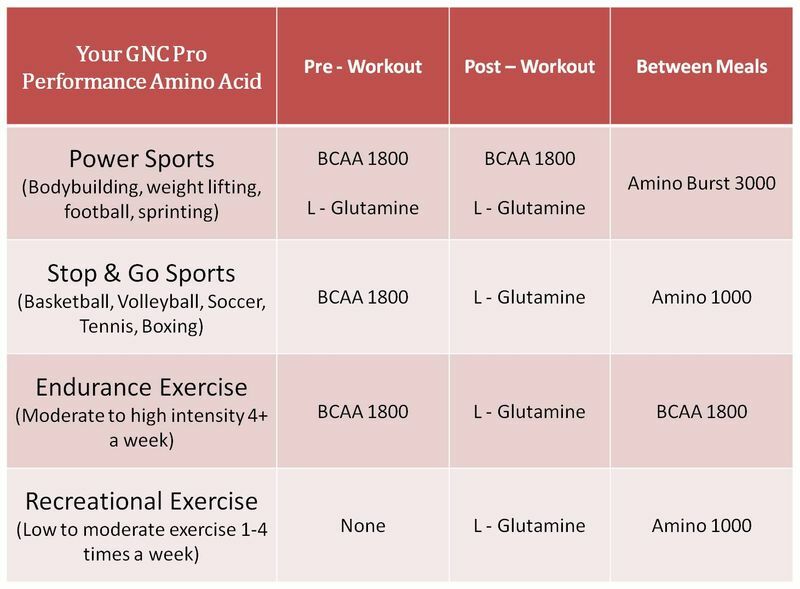 There are many amino acid products available; how do you know which one to take? Find yourself in the chart below and see which products match up. Hopefully you were able to find an activity in the chart similar to an activity you participate it. No longer do you need to be guessing about which type of amino acid to take. Follow the chart to feeling better and performing better. What activity do you need the most time to recover from?